The most recognized of vintage refrigerators is the GE Monitor-Top refrigerator. 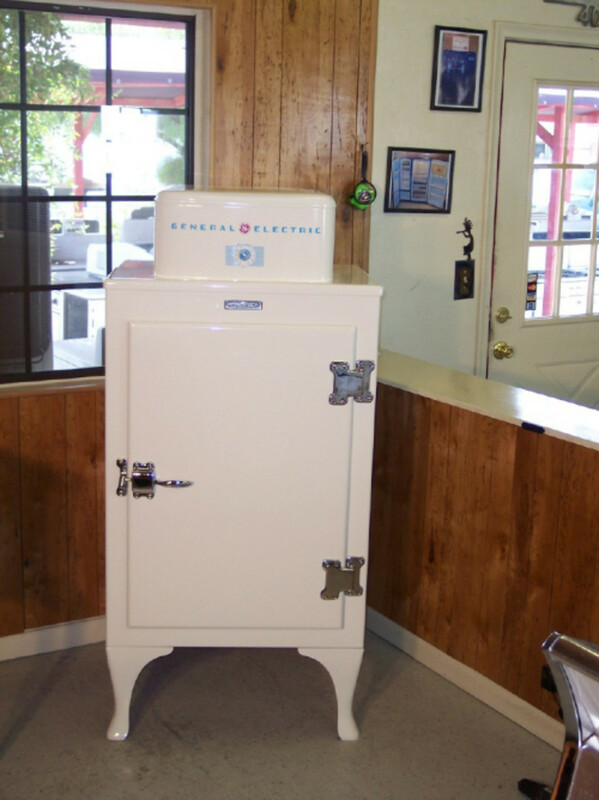 This residential refrigerator was introduced by General Electric (GE) to the general public in 1927. 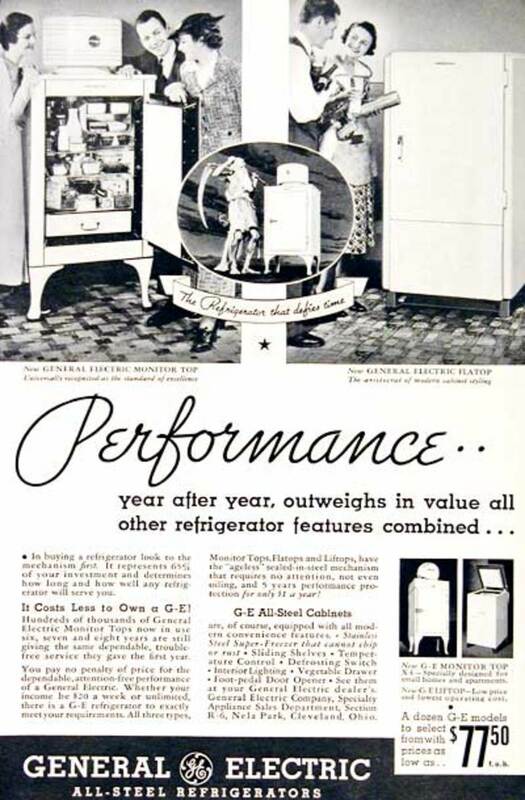 GE believed so much on its new product that it committed $18 million dollars to the manufacturing of these refrigerators and another million dollars to advertise them to the public. Over a million of GE Monitor-Top refrigerator first models were produced. The GE Monitor-Top refrigerator first models were certainly not the first home refrigerators in the market at the time. There were other home units which usually required the installation of the mechanical parts, motor and compressor, in the basement or an adjacent room while the cold box was located in the kitchen. 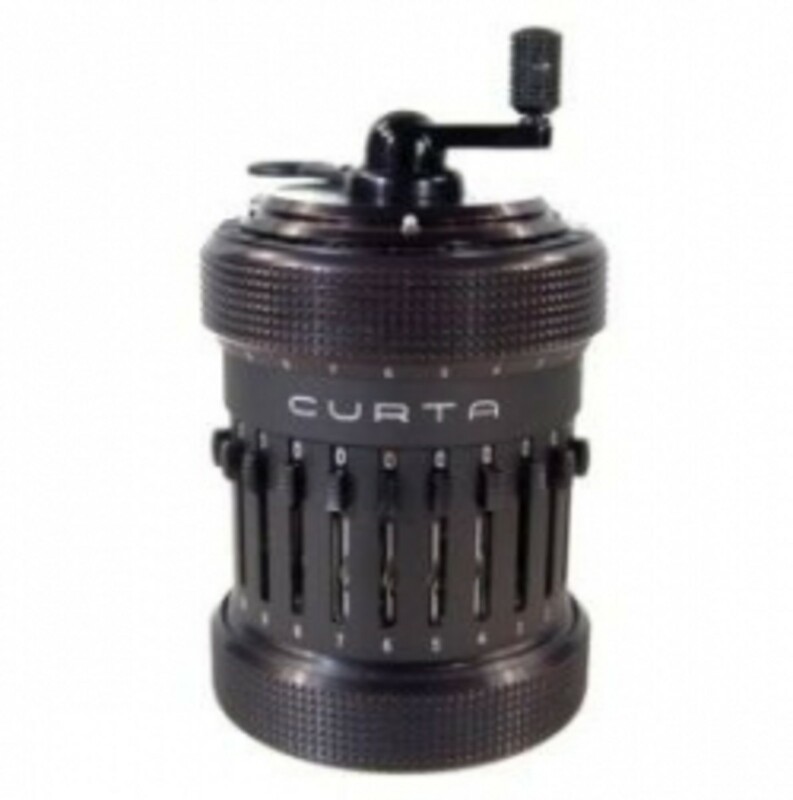 Then there was a 1922 model that consisted of a wooden cold box, water-cooled compressor, an ice cube tray and a 9-cubic-foot compartment but cost $714. The price was just astronomical considering a 1922 Model-T Ford cost about $450. With a price tag of only $300, GE Monitor-Top refrigerator first models were considered "the first affordable refrigeration units" for the average family. 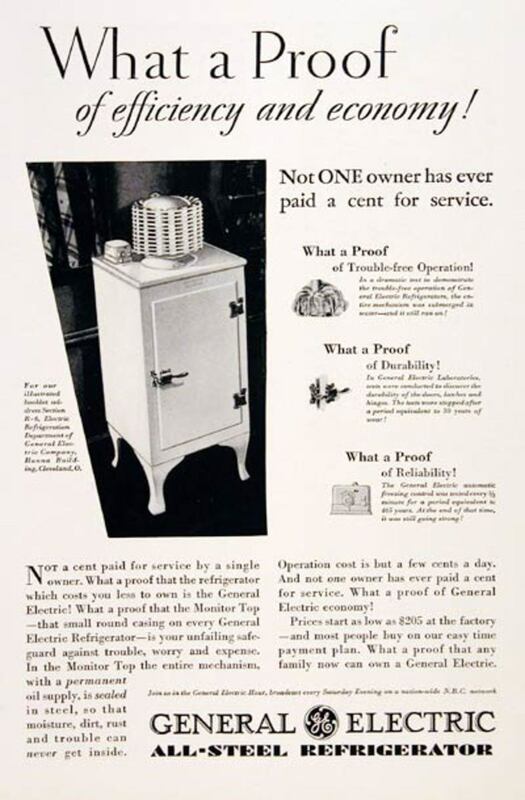 Many utility companies offered the GE Monitor-Top refrigerator to their customers for as little as $10 a month, simply added to their monthly utility bill. How convenient! GE was right. 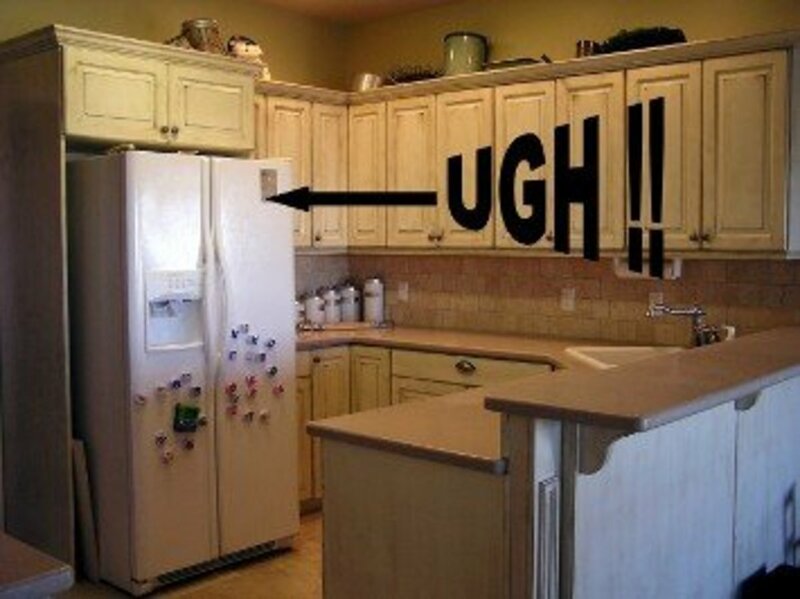 By the 1930s, 60% of households in the US owned a refrigerator. 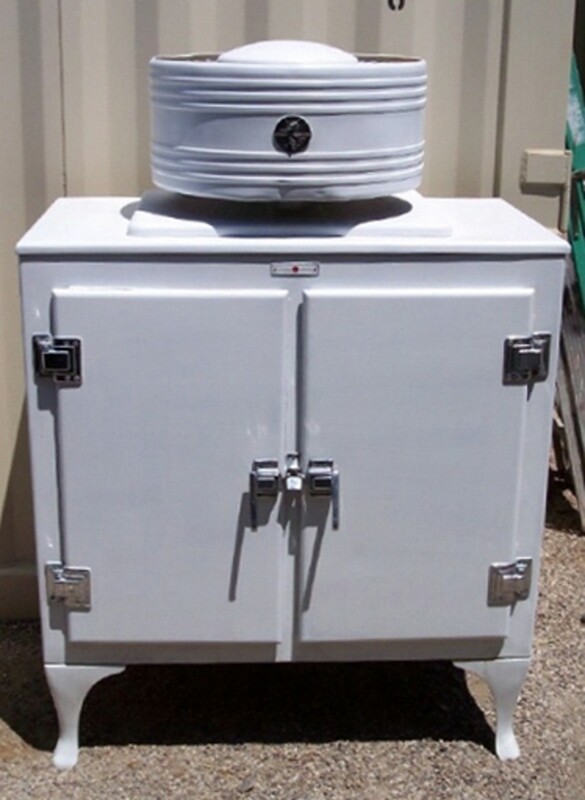 The GE Monitor-Top refrigerators' compressor assembly, which emitted a great deal of heat, sat on top of the cabinet and surrounded with a decorative ring. These were cooled with one of two refrigerants used during this time, sulfur dioxide or methyl formate, until the introduction of Freon. 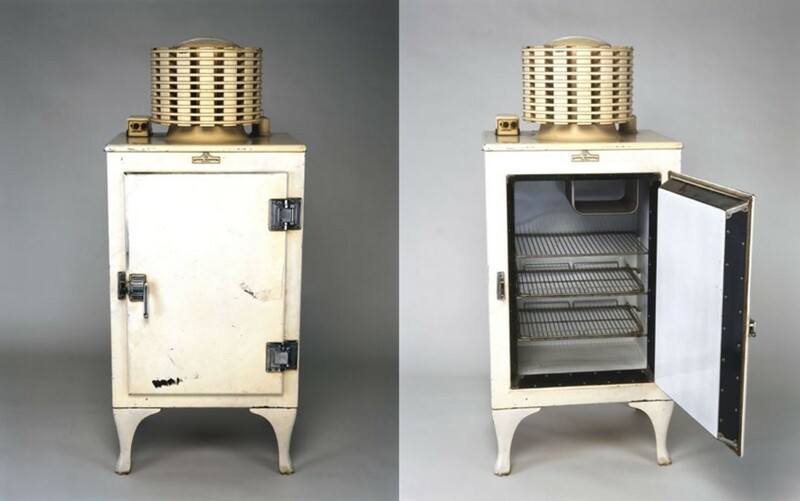 Although a few minor features were added along the way, such as enclosed condenser coils and slide out shelves, the basic design of GE Monitor-Top refrigerator remained the same from 1927 until 1936. 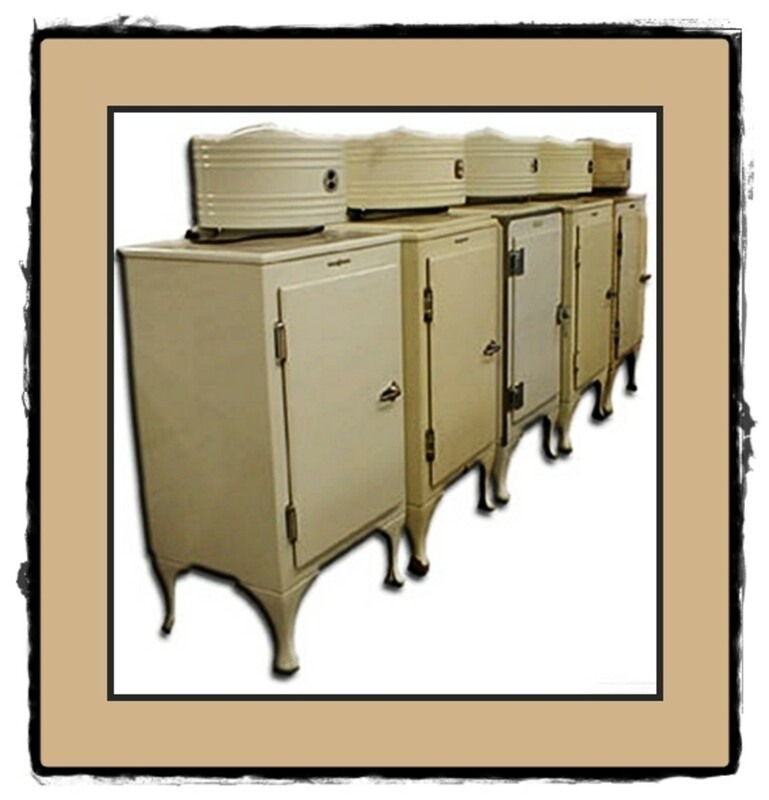 You can purchase finished or unfinished vintage refrigerators at a number of vintage appliance stores. 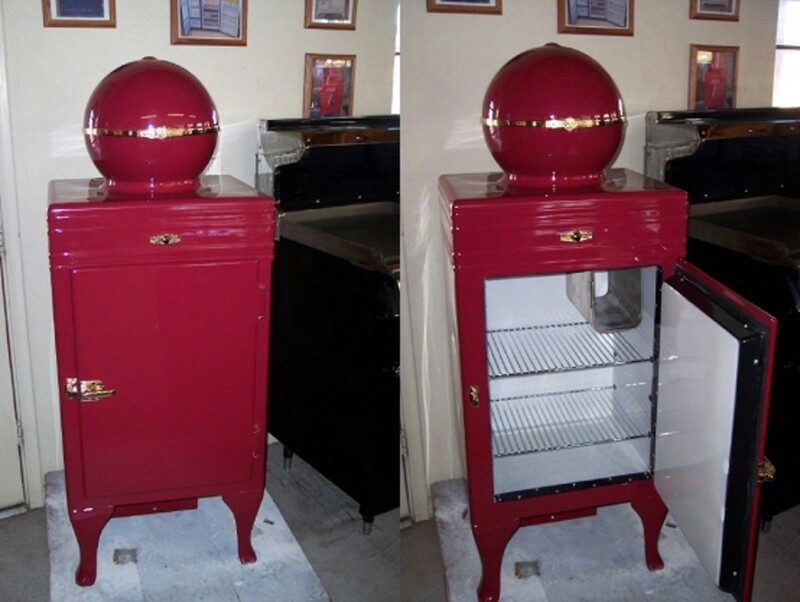 Or if you are like me who love going through garage sales, this vintage refrigerator is a nice buy. Some of them still work, but most of all this vintage refrigerator is a nice decorative addition to your collection of antiques, plus is a great conversational piece. 1927 General Electric Refrigerator original vintage advertisement. "Protect food from the killing chill of winter and the bacteria-breeding heat of summer." 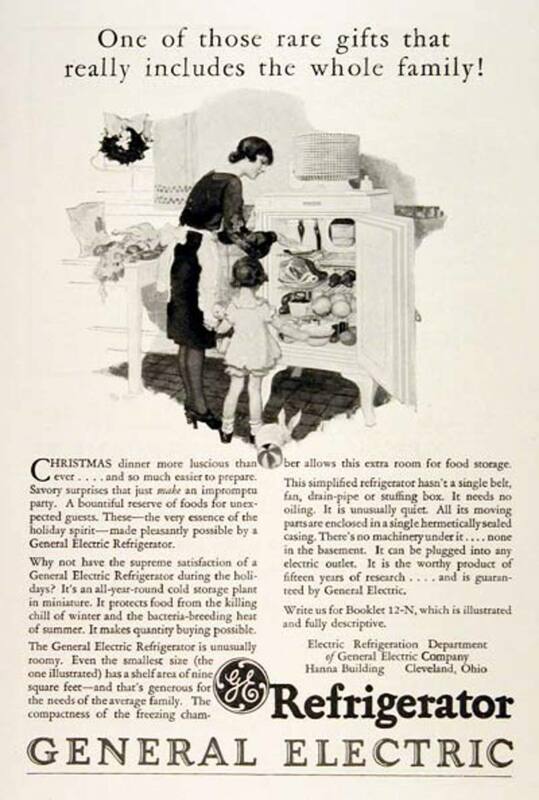 1929 GE Refrigerator original vintage advertisement. 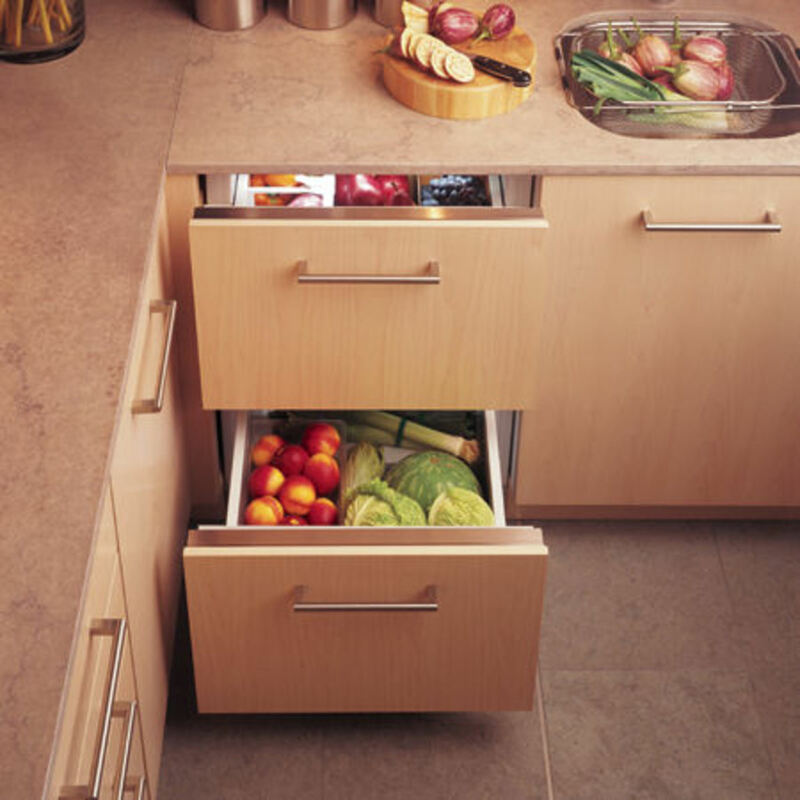 Day and night, automatically keeps food safely below 50 degrees. "It's always summertime in your kitchen." 1930 General Electric Refrigerator original vintage advertisement. 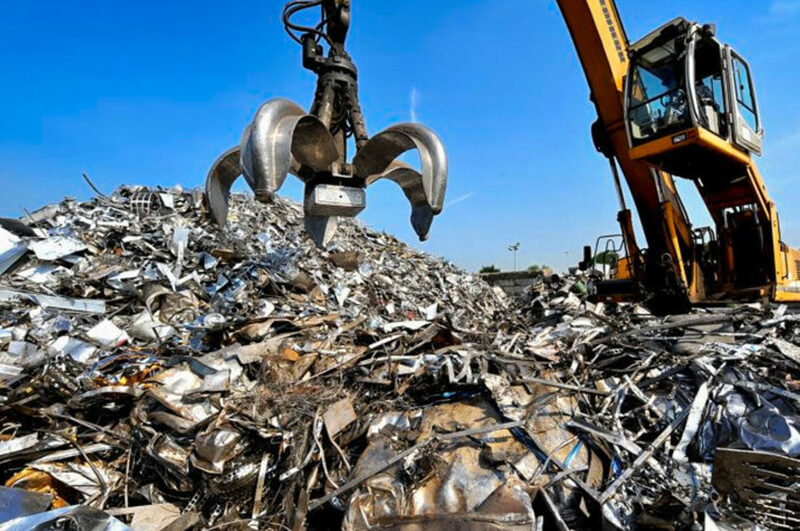 Proof of efficiency and economy. Not one owner has ever paid for a cent of service. The all steel GE refrigerator is permanently sealed with its own oil supply. 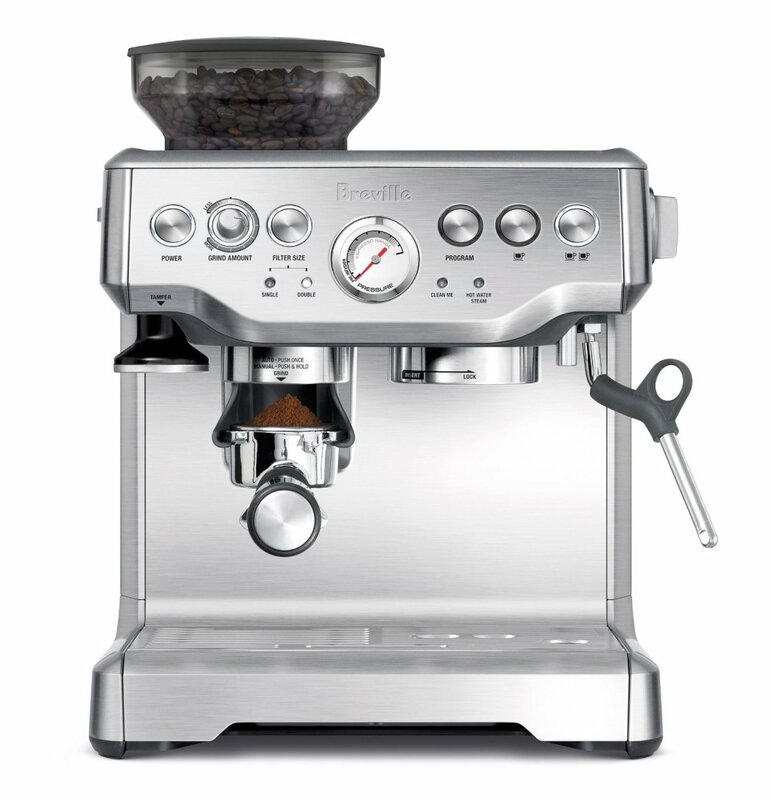 Prices start at $205 at the factory. 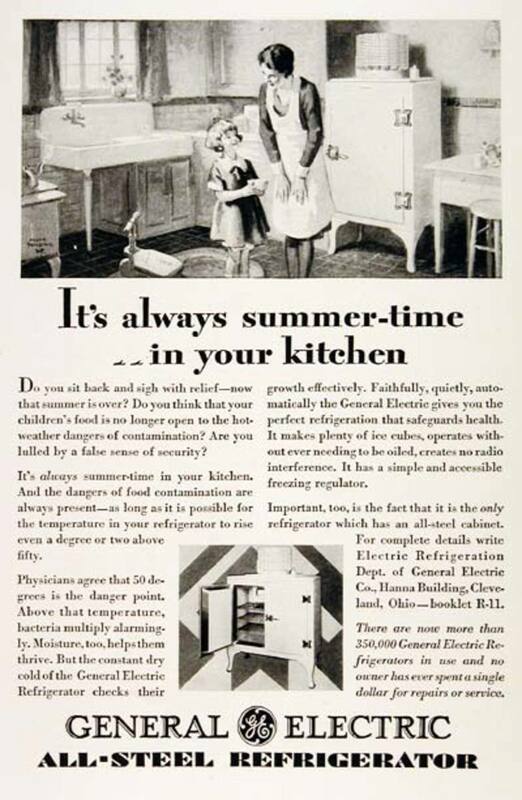 1935 General Electric Refrigerator original vintage advertisement. Showcases the new Monitor Top and the Flat Top models. List prices started at $77.50. "The refrigerator that defies time." Now a day how much are they worth? I have one i'm trying to sale. Greetings and some questions. What type of refrigerant used Monitor Top refrigerators? I have one of two doors. Or break down or ask for coolant. What live my refrigerator? In my house has almost 30 years and when he was not exactly a youngster. What year is it? It looks like 1930, double door, but it is a little different. Still makes ice in hot weather, in temperatures ranging from 40 to 50 degrees Celsius. 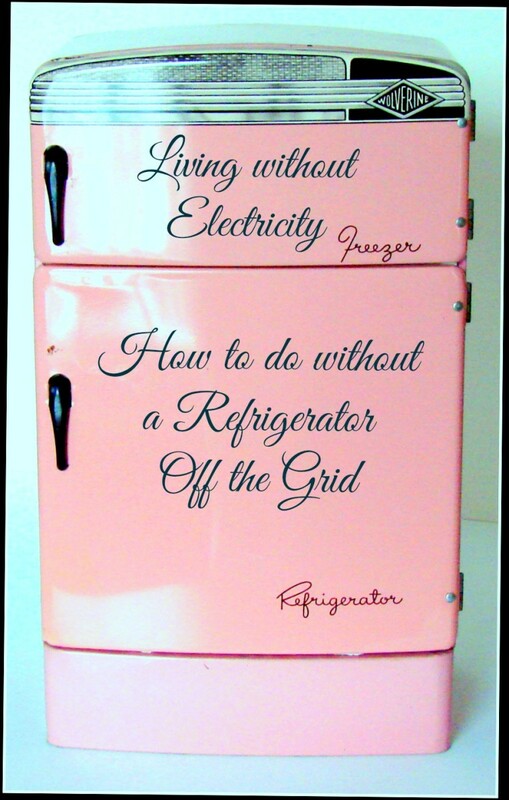 Does not ask anything to the current refrigerators, except to have internet access. Hiya Roy, thanks for dropping by and leaving me a comment. Wow! You have a 1938 ge monitor top with the foot lever for the door and the original ceramic castor and it's still working? How cool! But no ice cube trays? Aww! lol Cheers! Hiya L.L., thanks for dropping by. I know what you mean. lol I thought the design is quite interesting and some people still have them and they still work. Cheers! Hiya Glenn, thanks for dropping by. Yes, putting the coil on top was unusual but it was the best they could do at the time as the alternative was putting the box in another room as it heated up and was very noisy. lol the price was great, huh? Cheers! Hiya dahoglund, thanks for dropping by. I know what you mean, I've never seen a ge monitor top personally but I thought the design is quite interesting and some people still have them and they still work. Cheers! The GE Monitor-Top looks awkward in retrospect, but I imagine it was beautiful to those who owned it in its heyday. I thought I might recognize some of these but I don't.I vaguely remember when Ice was delivered and some people still had "ice boxes" where a block of ice was put in to keep food cold. Interesting how they had the coil on top in those days. Now it's hidden on the rear. I enjoyed your hub as well as the old ads you show. Looking close at them I was amazed that a refrigerator sold for $77.50 in those days. But that's inflation! lol. Hiya my dear friend Lori, thanks for dropping by. lol Definitely older than most of us here. But I thought it would be interesting to make it my contribution to this week's topic in HubMob Weekly topic - All things Vintage. Thanks for the vote up.. so sweet. Hiya Pam, thanks for dropping by. Me too! lol I came across a video on a 1927 GE Monitor-Top found by a dealer in such a good condition. So I got interested and tried to add the video in this hub but it was not allowed by the owner. But I thought it would be interesting to make it my contribution to this week's topic in HubMob Weekly topic - All things Vintage. I'm glad you liked it. Hiya Will, oh that was so cool that your sister found one of these vintage refrigerators and still working and that she used it for several years.. awesome! 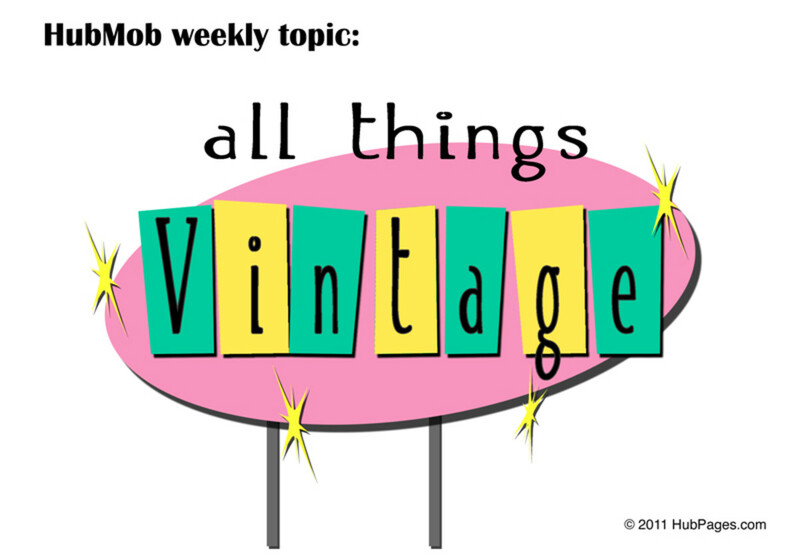 I'm glad you enjoyed reading my contribution to this week's topic in HubMob Weekly topic - All things Vintage. Hiya Greg, thanks for dropping by. lol You're not the only one.. I'd never seen this type of refrigerator before I saw it in YouTube. I thought it would be a nice contribution to this week's topic in HubMob Weekly topic - All things Vintage. Take care my friend. Hiya moncrieff, thanks for dropping by. I came across a video on a 1927 GE Monitor-Top found by a dealer in such a good condition. So I got interested and tried to add the video in this hub but it was not allowed by the owner. This is my contribution to this week's topic in HubMob Weekly topic - All things Vintage. Me too, I've never really seen this type of ice-box or refrigerator in movies. it was nice will learn about also refrigerators. I don't ever remember seeing one like that so I guess it not as old I thought. Nice hub. Back in the 80's, my sister picked up an old freezer that looked very much like this. She bought it for decoration but soon discovered that is still worked and then used it for years! What a great idea for a hub. 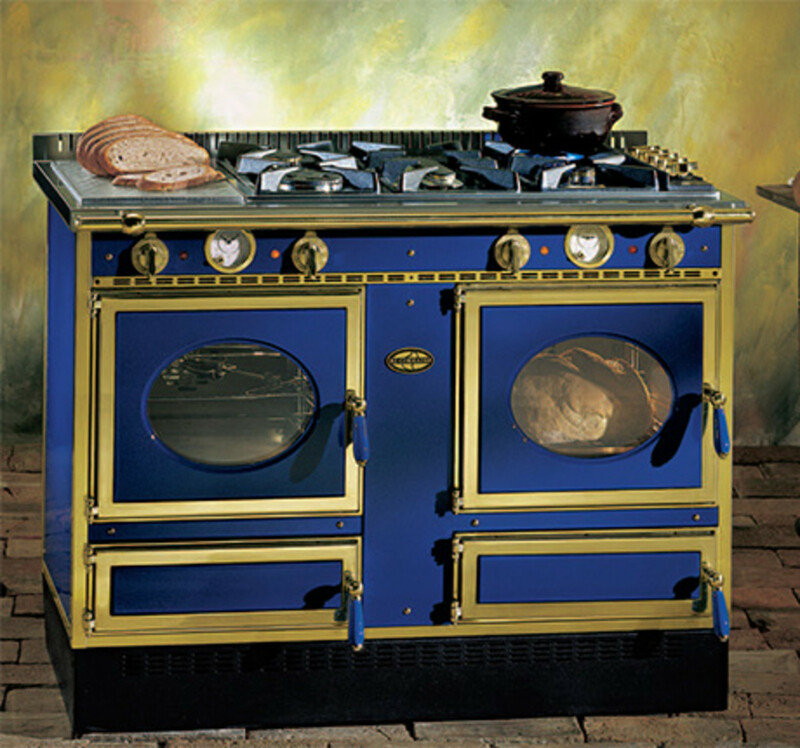 I'm not quite so old that i remember having one in the house but i do remember my grandfather had an old galvanized ice box in the barn. Ralph Cramden and Art Carney on the Honeymooners came to mind as i was going through this hub- ha! Great to know about the early iceboxes! By the time of household movies of 40s and 50s there were apparently replaced by the present-look refrigerators, for i had never never seen this early GE icebox in a movie.